PERLAVITA BIMBI (baby) Large hole bead with Rhodium plated Sterling Silver Insert. Great shape approximately 14mm round and 8mm wide hole to hole. The hole inside these is approximately 2.5mm and fits our PERLAVITA DUE Bracelet. This is in our Caramella Series. With Caramella the base begins with a white Murano Glass and the transparent colors encase the white. 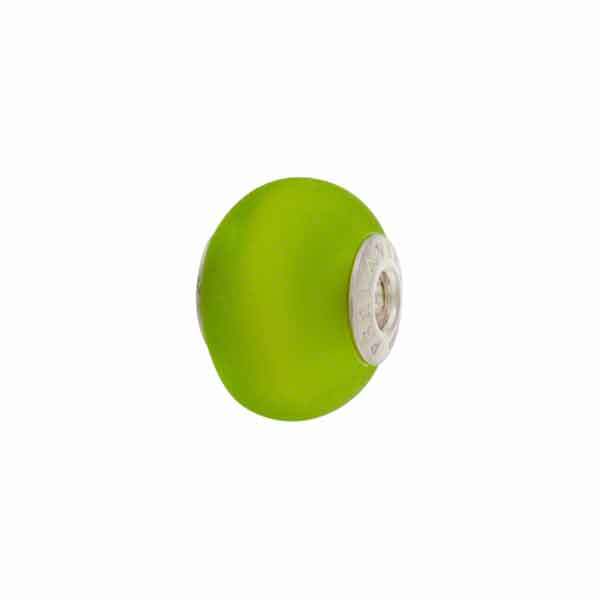 The color of this one is a Transparent Verde Erba (Peridot, Green) Murano Glass which has been matted (called satinato in Italian). It has the look of a sandblasted piece.